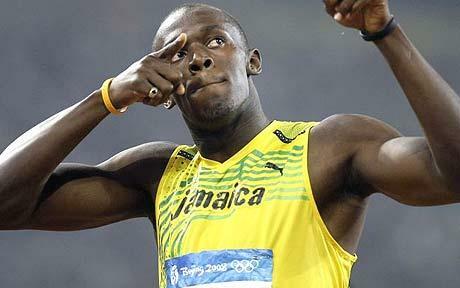 Happy 22nd Birthday, Usain “the lighting” Bolt. Today is the young world record holder’s 22nd birthday. The amazing 6’5 Jamaican won both the 200m and the 100m gold medals in Beijing and is easily the fastest human in the world. For the first time since 1979, one man holds the world record in both events. The last man to do so was Donald Quarrie, a Jamaican and it is a Jamaican holding the title once again. Bolt changed the sport, simply by winning both races in world record times. Some call the sight of him running, poetry in motion, and believe he is extremely elegant to watch. At 6’5 he is a rather tall sprinter but has none of the awkwardness of other taller sprinters of the past. He uses his huge 9-foot strides for his benefit much like Michael Phelps, Darren Heitner’s man crush (hahah), uses his long strides and perfect turns to his advantage. He really is a bolt of lightning, with a badass attitude.